Sunrise off the coast of Greenland. After settling in for a marathon ten and half hour flight to London, the captain announced it was raining at Heathrow Airport. How appropriate, as "Singing in the Rain" was playing on my airline TV. Eight years had passed since my last visit, and I was happy to be winging my way to the UK, rain or not. The impetus for this adventure started last winter, when Abel Gance's Napoléon was announced to be shown in London. My husband and I had previously hoped to see it in Oakland, California, in 2012, but expensive flights and extreme weather prevented us from going. So he said, you know if it happens to show in London why not go then. This was my second solo trip overseas. The last one was in 2003 when I saw a three-day Charlie Chaplin event at the Royal Festival Hall. The London Philharmonic, conducted by Carl Davis, accompanied the Chaplin's silent films. At that event, I met up with Chaplin Library founder, Dominique Dugros and his wife, Emeline, comic book creator and Chaplin fan, Garen Ewing, and founder of the Bill Douglas Centre, Peter Jewell. Unfortunately, the Dugros family could not make the 2014 journey, but the rest of us were planning to see Napoléon. As we chased the morning sunrise, the stars disappeared into a wash of pinkish orange light. 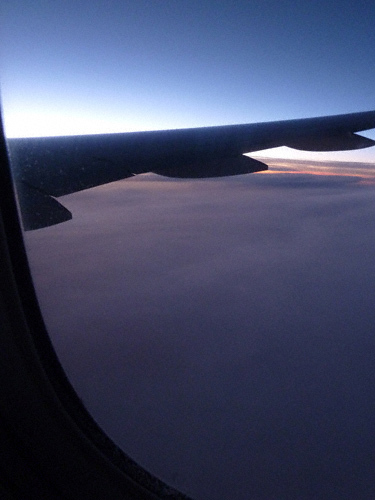 The flight had only a few bumps to remind me that we were still defying gravity at 39,000 feet. Once we were about three hours out of London, the sun beamed brightly through the window blinds as the clouds covered the earth below. The clouds finally parted, as we approached Heathrow. Below, lush green farm land stretched in all directions, as the trees lining the fields, glowed with autumn color. Compared to the dusty tumbleweed landscape of home, it looked like the emerald Land of Oz. For 45 minutes we did the merry-go-round with other jets, as we awaiting our turn to land. Once on the ground, getting to the trains was a long trek. I wasn’t in a rush, thankfully, and eventually reached the entry to the Underground tubes. In what was a first for me, I was taking the Underground from Heathrow into London. Even my travel agent hadn’t done that, so couldn't offer any advice. The walk worked out pretty well, but even with just one personal item and a carry-on roll bag, I felt I could have left more weight at home. A few times during the trip a few very kind Englishmen helped me haul the roll bag up stairways so common at the train stations. Traveling light is best. Being off season and a weekday, the tube train was not packed with tourists, so the journey was a relaxed one. The only problem was my pre-ordered London Travel Card, would not open the automated entry and exit gates. Evidently, this is a common problem with these cards, because they are easily scratched. I had to ask the Underground staff to let me through the tube gates, for the full life of the card. 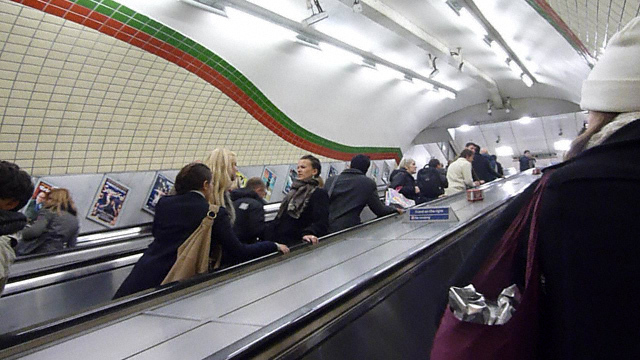 The London Travel Card is still the best value for traveling on the tubes and buses. The money saved was worth the trouble. Heathrow airport is a good hour’s ride from Central London. Away from the city, the Underground trains travel above ground. The stations in this section are elevated open air platforms. You have to walk downstairs to get to the ground level. Just something to remember when traveling by train. I was staying on the outer edges of the city in the Chiswick area. The bed and breakfast was a short walk from the tube platform. The Wellness Inn, an original Victorian home, had received good reviews and featured vegetarian breakfasts only. It seemed like the perfect place for health-conscious me, especially traveling solo. The hosts were welcoming and my room was comfortable, very clean and perfectly appointed. The neighborhood was inviting, with a variety of eateries, bookstores, charity shops, boutiques, antique stores and compact grocery store chains. All were within an easy walking distance. A bit further away was a laundry and a handy post office. On any trip, I like to check-out the neighborhood I am staying. While it was chilly, the weather was dry. There was plenty to see, as I tried the French restaurant called Côte, that was recommended. I had a delicious leek soup which was warming, and was the right touch to start my first evening in London. After ten years of planning, the Royal Air Force Museum at Colindale was opened by Queen Elizabeth in 1972. At the opening it had over 30 aircraft on display. Today, there are five hangers filled with over 100 vintage planes. 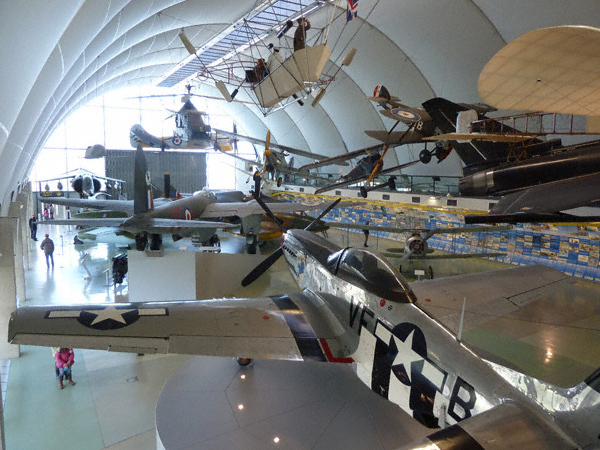 As one of the finest aviation museums in the world, the RAF Museum attracts visitors year-round. Hendon Airfield was historically the site for the first airport and first aircraft manufacturing plant in Britain. The current museum lies on the edge of the original Hendon Field. The remaining hangers and buildings have been restored and some moved. Inside the planes aren't only displayed at the floor level, but hanging from the ceiling, as if in flight. Precise planning was required to maneuver each plane into place, as they all fit like a finely positioned 3-D jigsaw puzzle. Each of the five hangers has a theme. The first one is Milestones of Flight with its impressive display of flying craft from the early 1900s to World War II. The displays can be viewed from different levels in this large hall. Along the wall on the main floor is a timeline of the history of flight. Next door is The Bomber Hall. It was filled with heavy aircraft from WWII  Buccaneers, Lancasters, and the massive Vulcan. In this hall, aircraft like the Vulcan made its final flight to the airfield and was towed into place. 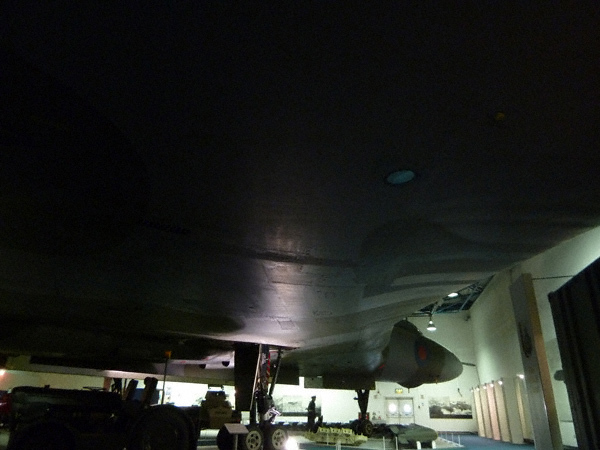 The size of the Vulcan creeps up on you, as you notice the sudden darkness as you walk under its massive wing. The tip of the nose is only a few inches from the wall. A museum volunteer talked to me about some of the unique exhibits in The Bomber Hall, like the decades-old crashed plane they rescued from a swamp. They show it, broken apart as found at the crash site, clearly revealing the ravages of water and mud. The corrosion consumes its skin even today, as the wreckage is treated with chemicals to slow down the decay. Attached to the Bomber Hanger is The Historic Hangars. These were the original buildings at Hendon. This hanger houses Chinook, Merlin and other helicopters, plus an array of fighter planes. The museum’s 4D theatre is located here. 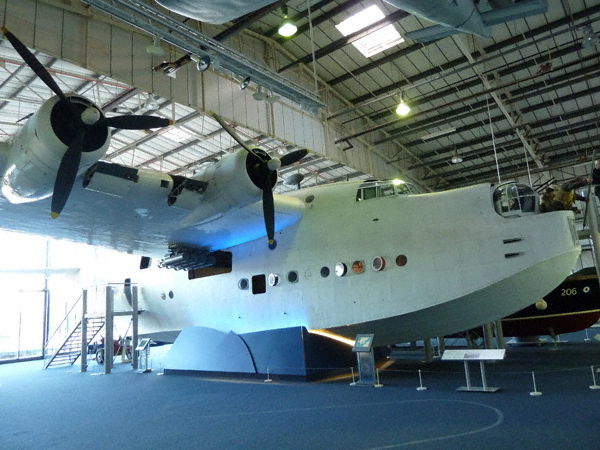 Some planes were set up as walk-through exhibits, like the Sunderland flying boat in The Battle of Britain Hall. Located across the main grounds, this hall included rare German military planes from both world wars. Exhibits in all halls were highlighted with history on the planes in pictures and text. My favorite hall was the last one called Grahame-White Hanger and Watch Office. 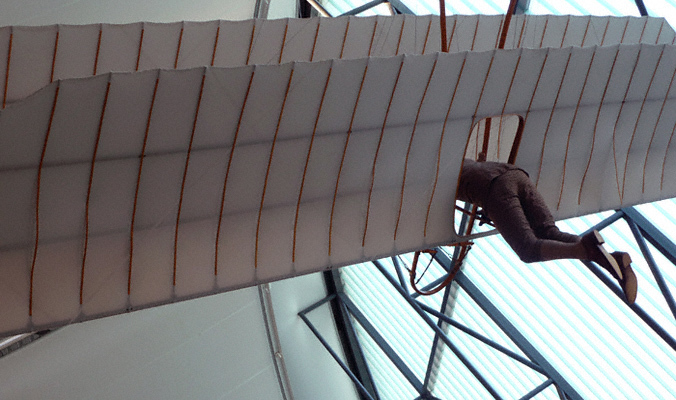 It's the home of Louis Blériot's British training school and the Grahame-White Aviation assembly plant. Blériot's school enabled pilots to train and fly in England instead of France. Grahame-White Hanger exhibits the oldest airplanes owned by the museum. One of the most impressive crafts was the Vickers Vimy. Created in 1917 as a heavy bomber, it was first used in 1919. One of the plane's none fighting jobs was to deliver airmail between Cairo and Badgdad. Benches are provided so you can sit and view these handcrafted machines. In its day, people flocked to the fields to see air shows, and see young men take their first flights. Hendon was one of the centers for RAF operations during both World Wars. The original Hendon Aerodrome can be seen in the film The Dirty Dozen. The scene is where film character Colonel Breed, played by Robert Ryan, is inspecting the troops. The original air field is gone now, replaced by new development, but the spirit of a century of flight is preserved at the museum. This museum deserves a full day visit, and if you love vintage aircraft, it is a must-see. And to top that off, admission is free. The only fees are for parking and special exhibits. There are two cafes, with one right amongst the planes and helicopters. Of course one could enjoy the outdoors and bring your own lunch. To see the top aircraft of the World Wars, or a time when people did fly by the seat of their pants, the RAF Museum is for you! As late afternoon approached, it was time to wrap up my visit. Students of all ages were starting to board buses to return home. As I was packing up to leave, the pulsating sound of a helicopter rotor caught everyone’s attention. Leaves were flying, as a military copter lifted off its pad. Students held up cellphones, snapping photos, all standing in the same area. My instincts from a past life as a photojournalist took over, as I broke off from the group for a better angle. The camera, used in movie mode, captured the raucous thunder of the chopper. Here is a video I created of the musuem for the experience. As the helicopter sped out of view, it was time to walk back to the bus stop. After years of fighting traffic, after musuem visits, what joy to be whisked back 'home' in the tube. I received a hearty welcome as my host, David, greeted me back at the Inn. Early evening provided a bit of time to explore my new neighborhood. I discovered yet more interesting shops and eateries, as I made my way along the high street. I really like the small neighborhood feel, as compared to being in the center of the city. The streets reminded me of the small neighborhoods that used to be more common in San Francisco. It wasn't touristy at all, just locals going about their day. That evening, I caught up on some email and planned the next day, which included seeing iconic London sights, and Charlie Chaplin in Leicester Square. After a hearty vegetarian breakfast, and lively chat with my Inn host, I struck out for the tube station once more. I was warned that weekends can be very crowded in Central London, especially around the tourist areas and museums. I decided to brave it and visit my favorite locales in the city. 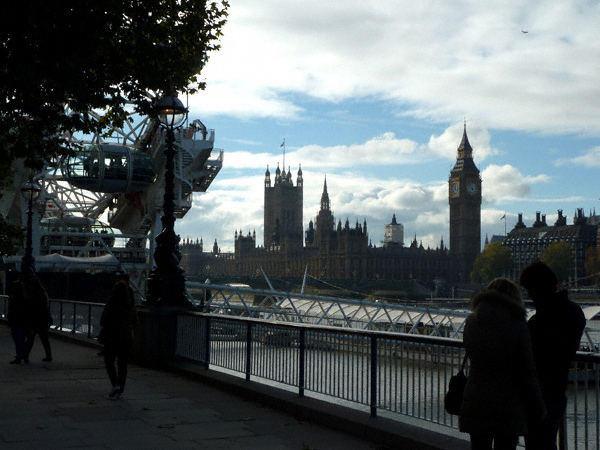 This included seeing the Parliament building, the London Eye, and the nearby Royal Festival Hall. After a thirty minute tube ride, I came out at the Embankment along the Thames River to find wall-to-wall people. In five previous visits, I have never seen it so jammed. Walking across the bridge became a slow slog, through a forest of standstill pedestrians. The bank of the Thames was lined with holiday booths on the first big weekend of the Christmas season. Christmas decorations, music, and the smells of roasting chestnuts, filled the slightly warm air. I made it into the Royal Festival Hall, in hopes of seeing something about the showing of Napoleon. But after looking around on different floors, I found nothing that even hinted about the event to come. I decided to explore new areas, but it took a while just to get away from the crowds. I learned later that a major tube line was down with a broken rail. The outage caused a flood of people to jam the remaining trains. After riding one very over-stuffed train, jammed to the doors, I decided to walk instead. Central London is very easy to stroll around, and you discover more with the slower pace. I didn't make it to some of the locations I was planning to visit, but you just learn to go with the flow, and discover new things. I did want to see my favorite silent film actor, Charlie Chaplin, in Leicester Square. So I slowly made my way to the Square. During that walk, I saw the biggest changes, since coming the first time in 2000. Many of the tea and Free Houses were gone, replaced by more fast food eateries. Old bookshops I once browse, were no longer there. Even some buildings were razed and replaced by newer structures. Seeing some casinos scattered about, was disappointing. One even shouted 'get your Las Vegas experience' here. I was there for an authentic British experience, not another American one. Charlie Chaplin's statue new home on the right hand street of the Empire (Casino and Theatre). Video of location. When I finally made it to the park at Leicester Square, I thought I was lost. The Charlie Chaplin statue was gone! I asked a lady sweeping the walk, if she knew what had happened to his statue. She said in broken English, that the statue had been moved up one of the side streets. It would take me a week to finally locate Charlie, but he is now on the right hand side of the Casino Empire and Theatre. I found the new location quite sad, compared to his former prominent spot in Leicester Square. I asked workmen who were still doing masonry work around the statue, if I could take photos. Later, I read a story about the statues in Leicester Square being taken down in 2010 for refurbishing. Only William Shakespeare remains in the square. 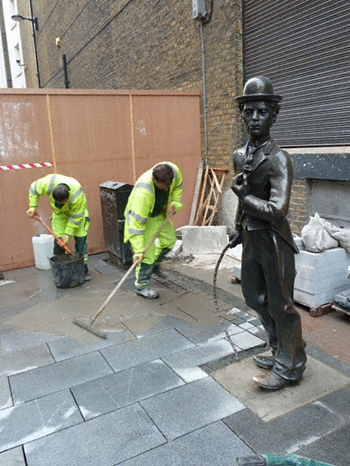 This fall, Chaplin’s statue was mounted at its current location by the Spotlight building. While the statue is back in public view, the location and mounting is not impressive. Hopefully, it will look better in time, but this side street can't replace the park. Heading back to my 'London home' I decided to have a nice dinner out at the same French restaurant to close the day. That evening I repacked to take my trip to Wales, and my first time visit to The Bill Douglas Cinema Museum at the University of Exeter. Copyright 2015 - Charlie Chaplin is a trademark of Bubbles Inc. SA used with permission. Charlie Chaplin, Chaplin and the Little Tramp, the images of Chaplin's on this website and the names of Mr. Chaplin's films are all trademarks and/or services marks of Bubbles Inc. SA and/or Roy Export Company Establishment used with permission. All Charlie Chaplin images Copyright 2001-2015 Roy Export Establishment. All rights reserved.